Wine Software | Wine Cellar Inventory Management. The world's best Wine Cellar Inventory Software ..." The Uncorked Cellar has an integrated wine guide providing winery details, wine ratings, value guide, winemaker's notes, cellaring guide, and a visual rack display for wines in your cellar. The wine guide section of the program includes information about over 950,000 wines. Scan the UPC barcode on the wine bottle to display details about that wine. Virtual Rack Wizard to organise your wine cellar. Printable or Pre-Printed Barcoded Inventory Tags to track every bottle in your wine collection. The Uncorked Cellar will easily capture, maintain and display your wine inventory complete with all wine-related information. 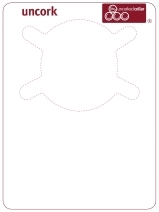 Create your own layout for these premium printable wine inventory tags, or hand write wine tasting notes on the tag. Add or uncork your wines using the barcode wizard in The Uncorked Cellar.